Fast forward to July 21st, 2018 where Freddie Smith proposed to me (more on that here.) At first, we were so caught up in the excitement of the engagement that we were thinking about a May 2019 wedding. It also just so happened that one of my best friends, Ariane Winans, was getting married in April 2019, so we thought how fun would it be to do bridal activities together! Well, after looking into all of the planning, Freddie and I realized the best decision for us was to take our time, enjoy our engagement, and the wedding would happen when it was meant to. 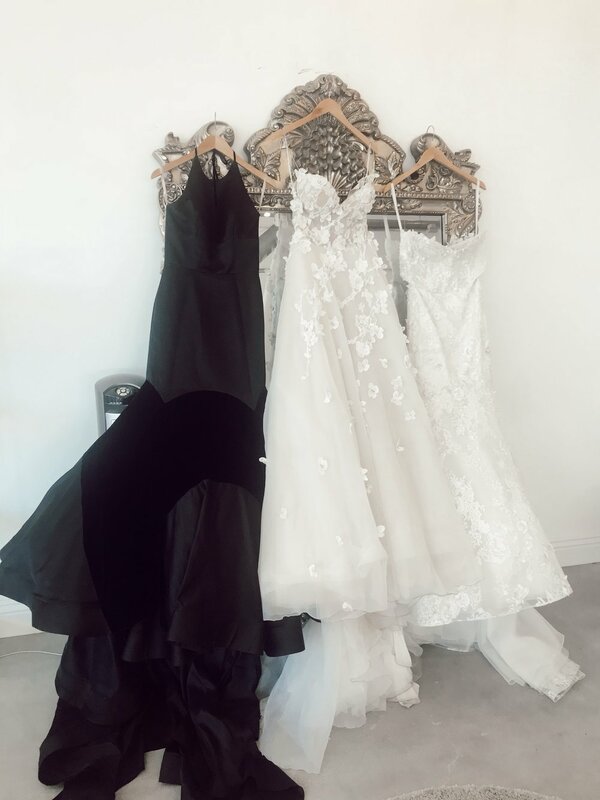 However, a future bride can never start the dress hunt too early, so Ariane made an appointment for us at Kinsley James in West Hollywood! As I walked into Kinsley James, I was greeted by an exuberant Ariane, handing me a glass of champagne. I looked at her in shock as I took in this incredible showroom that was Kinsley James. Just then, a bubbly brunette with bright, turquoise eyes came over and introduced herself. This was Ivey, and she was going to be our bridal stylist! Ariane and I began to look through these absolutely magnificent and breathtaking dresses. Going into this day, I had an idea of styles I enjoyed, but I wanted to stay open-minded. After all, what looks good in photos may look completely different on. I gasped as I pulled a gown out and Ivey smiled at me saying, “Ah, yes, you have excellent taste.” I turned back to her and replied: “what makes you say that?” She then signaled towards the price tag. YEP. GREAT TASTE BUT ONE I MOST DEFINITELY WILL NOT BE GETTING. Regardless, I still had to try it on! A girl can dream, right? We continued sorting through the dresses, and after we pulled the ones we wanted to try on, we made our way to the dressing rooms. Here were some of my favorite looks! I can’t lie, I have pinned the crap out of this dress on Pinterest and have had my eyes on it for quite some time. This is “The Collette” by Liz Martinez. And yes, it was as dreamy as I could have imagined. The detail is exquisite, and I fell in love with it the moment I put it on. Remember that first dress I pulled right away? Allow me to introduce to you “The Venise” by Pallas. Ivey grabbed a train to attach to the dress, and it was an absolute show stopper! I love a good detail, and this dress brought it. I just cannot get enough of Liz Martinez! I instantly fell in love with “The Celine” the moment I put it on. It was a bit see-through (which they mentioned they could fix when designing it) but there is something I adore about the simplicity of this dress. It was effortlessly chic, and I loved that! I, unfortunately, didn’t write down the designer for this next dress. I think it could be Rivini but don’t hold me to that - Lol. However, I enjoyed the same simplistic elegance of this gown along with the unique flower detail. Earlier I mentioned that brides to be should keep an open mind when trying on dresses. “The Lauryn” by Rivini really caught me off guard as I wasn’t sure how the mermaid silhouette would look on. I was beyond pleasantly surprised with this dress! As we were wrapping up, Ivey came up to me and goes I have one more dress I want you to try on. From getting to know you, I feel it is so you. Done and done! Ivey left as I waited excitedly. When Ivey made her way back into the dressing room, I saw an absolute jaw-dropping black wedding gown in her arms. I was in love. Ivey explained to me that it used to be tradition to wear black on your wedding day signifying “until death do us part.” It wasn’t until 1842 that Queen Victoria wore white at her royal wedding and the tradition changed! I present to you, “Wednesday” by Tara LaTour. 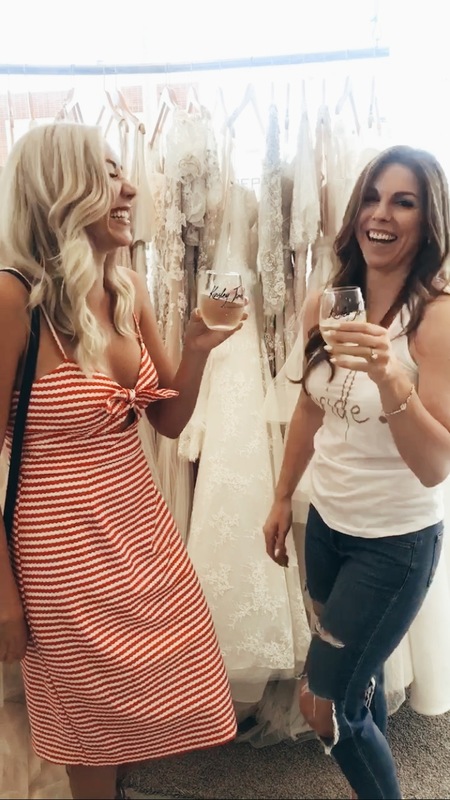 I haven’t said “Yes to the Dress” just yet, but it was such a wonderful experience at Kinsley James and exploring my taste! So how did Ariane and I end our magical day of trying on wedding dresses? As every bride to be should: Pizza. ALWAYS pizza.